It can be quite difficult to get noticed on a large marketplace like Etsy - even if you have great products that people want to buy. To maximise your chances of your listings being seen on this hugely popular handmade platform, you'll need to put some time into improving your Etsy SEO. First, lets start with the basics. SEO is short for Search Engine Optimisation, which is an overly technical way of describing the process where you make sure that your webpages can be understood by search engines so that they display your page above others. This increases your chance of being found, and thus increases your chances of making a sale: this is why SEO should be a huge part of your marketing strategy. Etsy does a lot of the external SEO work for you as it is their site you are displaying your products on (and they have a vested interest in making sure that they appear in big search engines like Google), but there are quite a few small but powerful things you can do to move your products above your competitors on the Etsy search engine itself. This phase should be your guiding light: assess each of your product pages independently and start tweaking your titles and descriptions with this in mind. This should be a constant process of improvement and can very much be a case of trial and error, so don't give up if you don't see any massive gains immediately - it can take time to see the results of this work! Small changes can sometimes be best - by monitoring the tweaks as you make them you can then discover your best SEO strategy going forward. Everyone's strategy will be slightly different depending on what they sell and where they are based: so what may work for some may not work for others. Be open to experimenting and improvement and you will start to see some positive results! For each of your products, think about how you would search for it on Etsy as a customer. You will want to be as obvious as possible and avoid using any technical jargon that an average person wouldn't be aware of. One great way to find some titles would be to ask friends and family to describe some of your products in a short sentence: this will give you some great words you may not have even thought of using. Another effective way of finding good titles is to use the Google's Keyword Planner tool. You can type in words and get a list of suggested keyword ideas and even see how those keywords tend to perform across the web: this will give you an idea of how common they are. Remember, the more common the word the more people will be using these words within Etsy to search for your products. Another interesting way of finding keywords and common phrases is to use the Etsy search itself. Find similar products to yours and see what sort of terms they are using in their titles and descriptions (without directly copying of course). Don't worry about capitalizing or adding an "s" at the end of each term. 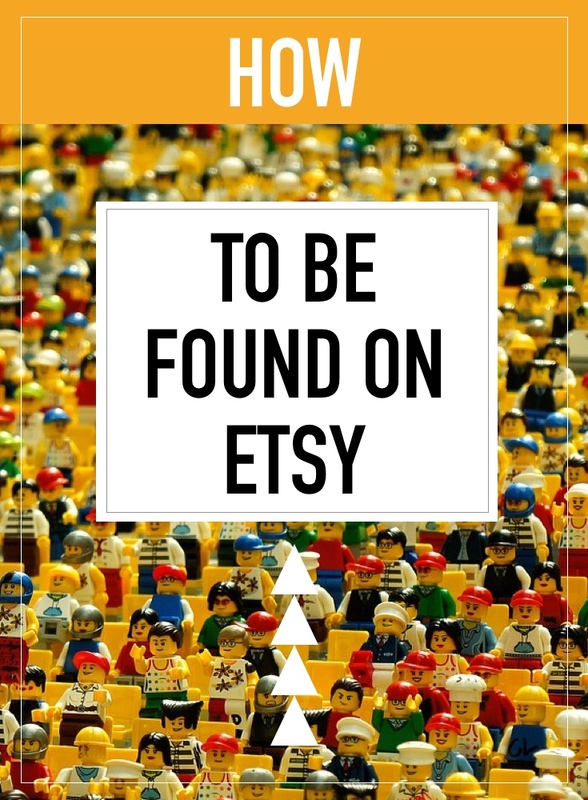 Etsy will automatically add both into the search for you. Make sure your product titles on Etsy are descriptive and as unique as possible. Example: If you have a product called "Blue Bag", a much better search friendly description would be "Blue Canvas Shoulder Bag with Star Design". Why is it better? More detail in your titles means that people searching for something like "canvas blue bag with stars" will see your product near the top. Using a general description puts you in the sea of others also selling "blue bags" of various patterns and fabrics: you may never be seen in this case, even if you are exactly what they are looking for. Try to be as short and sweet as possible: Etsy recommends no longer than 80 characters for titles, and make sure your "strongest" words for search are positioned at the start of the title. For the example above, if you find more people are looking for the colour of a bag above the design featured on it, make sure the word "blue" appears before "star". The description field is often a forgotten part of the SEO picture. This is used within Etsy's search engine as well to find relevant results, so use this to your advantage. Use natural, conversational language here using some of the keywords you have discovered above and avoid using random lists of keywords (aka "keyword stuffing") as this can be a penalising factor in searches. Remember, descriptions are a huge part of your marketing: they help to convince the buyer to go ahead with the sale once they have arrived on your page so you'll need to have both your "salesperson" and "SEO" hat on here. You can use up to 13 tags per product, so use them all! Make sure your title terms are here as Etsy will use a combination of tags and title to determine the strength of the search match. Also use some of the lesser known keyword terms found above that didn't "make the cut" for your title. Try to use phrases rather than individual words: Etsy uses these in much the same way as titles so for the example above "blue fabric bag" could be a good tag to use. If you have can't think of 13 tags, you could try adding a couple of minor misspellings (neklace for necklace, for example): keep in mind with this approach that the number of people searching using a misspelling will be very small. The length of time that a listing has been available on Etsy has an impact on the search results, so relisting often and creating new products in your range can lead to increased ranking in some situations. Etsy doesn't tend to disclose exactly how recency fits into the algorithm other than to say that new listings are "neutrally weighted", so it's worth experimenting with a couple of new products against some of your similar old ones to see the difference in action. Some people also tend to filter by "newest" in the search results to see items that have recently been added, so recency is worth factoring into your overall strategy. Etsy will also assess the quality of your listing and will use this "quality rating" to determine where you should appear in the search. This is somewhere were you can make some big wins with a small effort. If a user clicks, favourites or purchases your item after viewing it in the search results you'll improve your listing's quality score. This means it's vital to start selling your product at the search results page, and the best way you can do this is by having a great photograph that stands out from the rest. This will lead to more click-throughs and faves, which may not immediately lead to sales but will lead to traffic coming to your page. The next step from here is to work on converting your visitor into a customer. This means having a great description, a series of additional photographs that highlight the features of your product alongside some of the "Customer experience" factors outlined in the next section. When determining customer experience on Etsy, we look at positive reviews, completed About sections, and completed Shop Policies (FAQs and seller details are not factored into search ranking). As this information is not hugely widely known as yet, it can be a really good way of leapfrogging your product above your competitors that are not yet in the know. Your About page can be a great way of adding some additional terms that can be useful in being found on Etsy and across the web, so make sure it is detailed. It's an excellent way in helping to show the customer who you are too, which is great for building trust in the potential sale. Ensure that you are asking your customers to leave a review after they receive your product as this is another big part of the new Etsy search logic. To increase your likelihood of receiving a good review, make sure that you communicate with your buyers quickly and honestly and manage their expectations throughout the entire purchase. Packaging your products with care and attention, and offering a small discount for future purchases can also encourage more reviews.